Mr. Weekday Rambler planted tomatoes this spring. 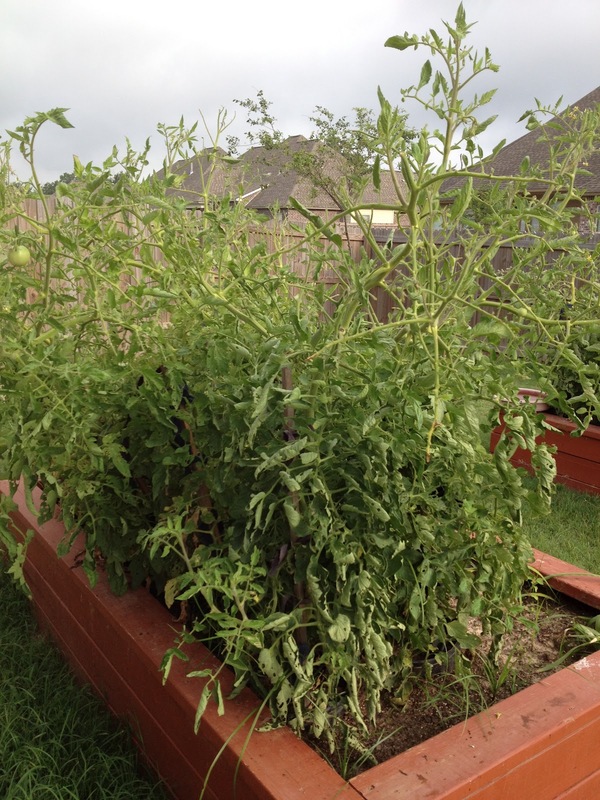 He planted about a dozen plants in his carefully tended raised beds in the backyard. The early year activity consisted of enriching the soil and turning it over and over in preparation of the summer fruits it would yield. Each morning he lovingly watched the progress of his farming attempt. He tied the plants and "suckered" the shoots. He used gallons (it seemed) of fertilizer. 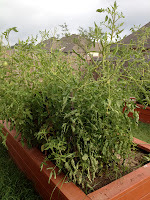 Finally the tomatoes appeared. It so happened that the birds and worms liked them too. In an effort to win a battle with those creatures, he picked the tomatoes when they were large but green. They were set on our kitchen counter to ripen. Finally we were able to try them and share them. We have enough for a small army. 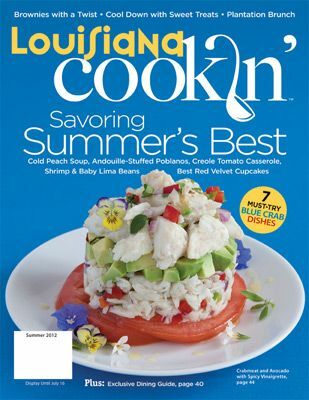 The first ripe tomatoes had to be used in a really special recipe, so I consulted a favorite source of inspiration: Louisiana Cookin' magazine. It's published bi-monthly and a subscription for one year is $25. It's $25 well spent for the food lovers and cooks among us. I look forward to its arrival in my mailbox. For those not familiar with this publication, it originates in New Orleans, LA and is chocked full of information from chefs of Louisiana restaurants and presents lots of ideas for using food produced in the state. Seafood and sweet potatoes are often featured. It's also a great source for cultural information. A Dining Guide is helpful for those wanting a preview of a restaurant before trying it. Annually they produce a compilation of their published recipes in the form of a CD that can be ordered from the website. The website also has many of the recipes that can be printed or downloaded and saved. A regular department of Louisiana Cookin' is "Reader's Recipe." Once I submitted a recipe and they published it. What a thrill it was to see one of my ideas in print. My recipe was called New Year's Eve Shrimp and it can be found by clicking here. I didn't get paid, but they sent me a gift certificate to a restaurant! What fun! The regular columns in Louisiana Cookin' include information on herbs by Sarah and Trim and Terrific ideas by another one of my favorites, Holly Clegg. Seasonal Louisiana foods are featured in each issue. The photography is mouthwatering! Can you tell that I LOVE this magazine? The most recent cover is pictured above and I tried the recipe on the cover. 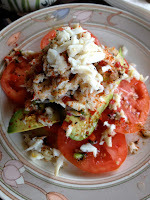 It is Crabmeat and Avocado with a Spicy Vinaigrette. What caught my eye was the layer of tomatoes on the bottom of the stack of ingredients. I selected the ripest of the harvest and got busy gathering the ingredients. Since we don't live on the coast, it is not easy to find good fresh lump crabmeat. A trip to Tony's Seafood in Baton Rouge was in order. Tony's is Louisiana's largest seafood market and I found just the right product needed for the recipe I wanted to try. Armed with the crab meat, the ripest avocados I could find and the tomatoes from the backyard, I was able to create a delicious summer supper. My rendition of it was a little different in appearance, but the flavor was superb. The recipe in the magazine states that this serves 12, but we had very generous portions and it may have served 3 or 4. I suppose it can be a starter with the smaller portions, but we enjoyed it as our main course. For our dinner, we each had a half of an avocado and a whole sliced tomato. The vinaigrette was a generous portion, so I saved about half of it for another time. All that was needed was a loaf of hot bread to complete this light meal. I spent so much time food gathering (three stores) that I forgot to get some bread. I had a bag of Zapp's Sweet Potato Chips in the pantry, so we had those instead. 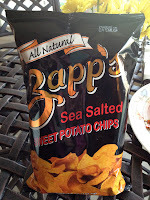 Zapp's is another Louisiana company that uses Louisiana products exclusively. The Sweet Potato Chips were new for us and we enjoyed them immensely. I recommend them heartily! I didn't feel too bad about eating these chips since the package advertises they are natural, gluten free, cholesterol free and contain no artificial ingredients or additives. 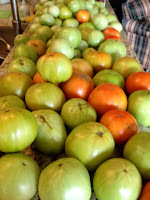 The best part is that they are produced about 30 miles from our house, so they are very fresh! And what meal would be complete without a great bottle of wine? We have found one that we enjoy very much. 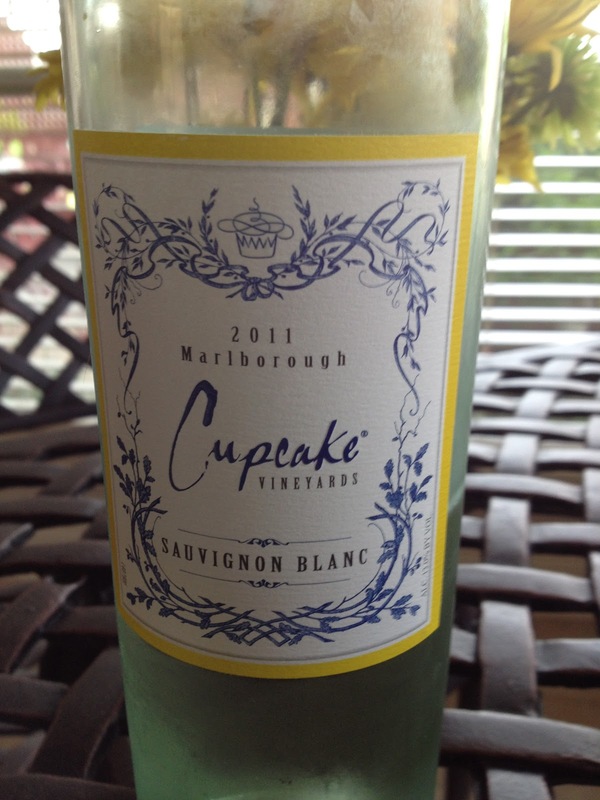 It's Cupcake Sauvignon Blanc. 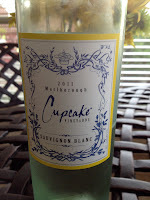 This New Zealand selection has become our "house wine" since it is often available by the case where we shop. I love the crisp, dry flavor. I prefer it over the traditional sweet tea that many Southerners consume with their meals. We keep some chilled at all times. It's great with food, but stands alone well for a pre dinner aperitif. Lately my sous chef has been spending her time outside with Mr. Weekday Rambler aka Paw Paw Allie, but I was able to find a recent photo of her that was snapped while she was enjoying some backyard time. 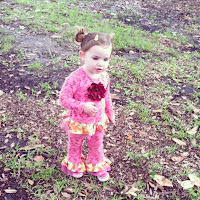 I thought you might like to see how she has grown since last she was seen on the Weekday Rambler. 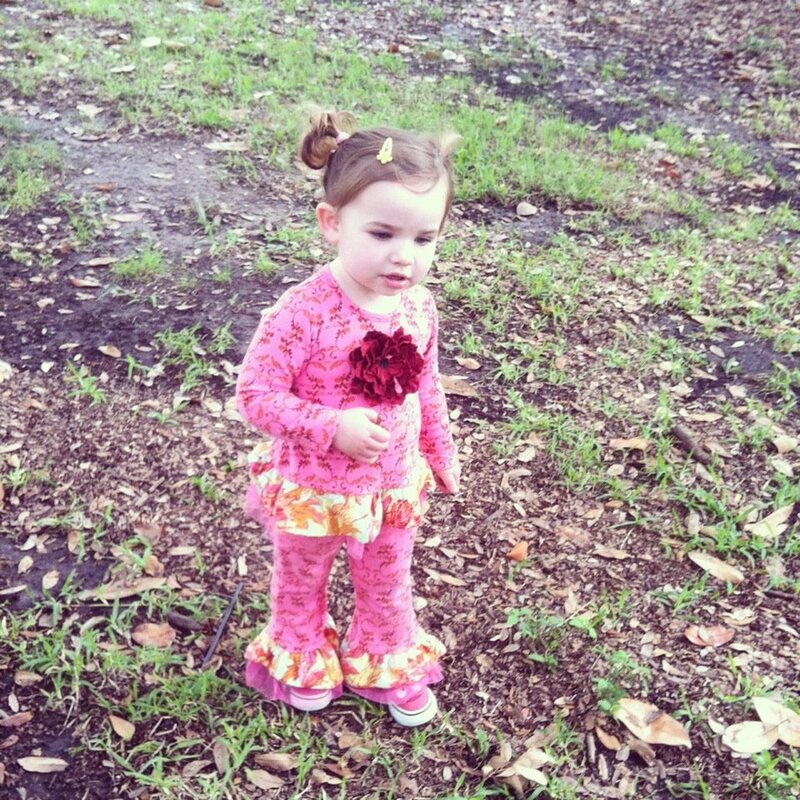 Pretty soon she will be in the car with me on my "rambles" and in the kitchen to assist with the preparation of our meals that we often enjoy together. Let me know if you tried the recipe and if you liked it as much as we did. Happy rambling and cooking!